Paco Díaz (Palma de Mallorca, Spain) on 19 November 2008 in Architecture. Otro de los pabellones del Hospital de la santa Cruz y san Pablo (Barcelona), que es el conjunto arquitectónico más impresionante del modernismo catalán. El proyecto lo realizó el arquitecto Lluís Domènech i Muntaner (1850-1923). Junto con el Palau de la Música Catalana fue declarado Patrimonio de la Humanidad en 1997. This is another one of the pavilions of the Hospital de la santa Cruz y san Pablo (Barcelona), the most important architectural complex of the modernism in Spain. Its author was Lluís Domènech i Muntaner (1850-1923). 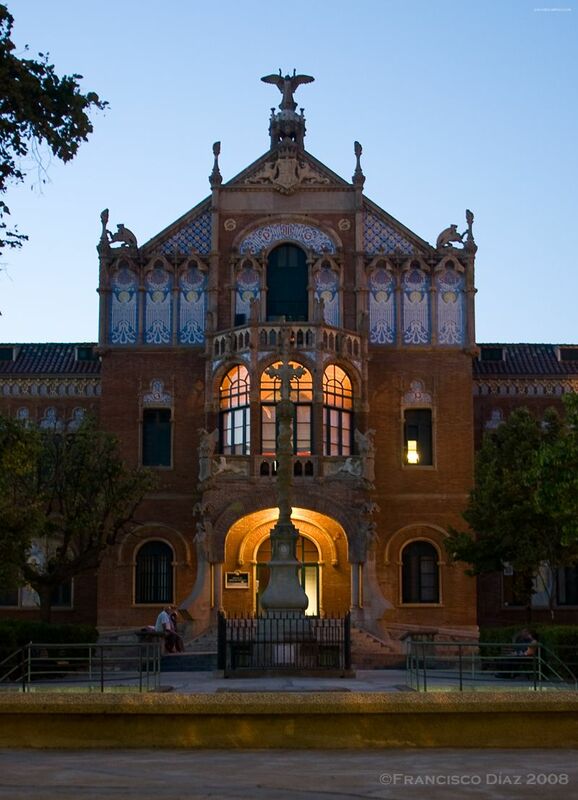 The Hospital and the Palau de Música Catalana were declared Patrimony of the Humanity in 1997. Beautiful light on this image, Paco - such an inviting scene. A beautiful building, those details, wow!! a very grand shot and entrance Paco! beautifully built -- the painted design on the top front ledges is very captivating!! belle lumiere, qui rehausse cette entrée ! A beautiful image of light and color. What a captivating sight Paco! The light and colours are just beautiful! What an exquisite building and image. A lovely warmth and glow. Extraorinary architectoral photo, with a special athmosphere, by the fine light. A beautiful play of light! You have caught this in perfect light . . quite unreal in the ornate beauty. Excellent shot, the warmth provided by the light is teriffic. Muito bem, esta mistura de luz natural e artificial. tendré trabajo para ir repasando las fotos de estos últimos dias. Acabo de ver las tuyas, y la que más me gusta, es la de la cafetería. La iluminación es buenísima y me encanta la soledad de un local tan asociado al bullicio de la gente. Beautiful detail and light Paco, lovely to stop by your page as always. Tambien estupenda, la luz de la puerta es una parte fundamental de la foto.